By the late 19th century, Augustus Saint-Gaudens was widely recognized as one of America’s finest artists. Such was his reputation that President Theodore Roosevelt personally commissioned him to design the 1905 Inaugural medal. Roosevelt was quite pleased with the result, and enlisted Saint-Gaudens as an accomplice in his “pet crime” of fashioning a new look for U.S. coinage. The president had a specific concept in mind: to mint high-relief coins in the style of ancient Greece. “High-relief” is a numismatic term to indicate the distance between the highest and lowest points of the coin is greater than usual. In other words, the coin's raised featured protrudes higher from the its surface than one would normally expect. My dear Saint-Gaudens: How is the gold coinage design coming along? I want to make a suggestion. It seems to me worth while to try for a really good coinage; though I suppose there will be a revolt about it. I was looking at some gold coins of Alexander the Great today, and I was struck by their high relief. Would not it be well to have our coins in high relief, and also to have the rims raised? The point of having the rim raised would be, of course, to protect the figure of the coin; and if we have the figures in high relief, like the figures on the old Greek coins, they will surely last longer. What do you think of this? With warm regards, etc. Thus began an extraordinary collaboration between Saint-Gaudens and Roosevelt. While balancing matters of high importance to the nation, the president always devoted the time necessary to upgrade America’s image through her coinage. The master artisan Saint-Gaudens agreed with the high-relief idea, and set out to fashion new designs for the one cent coin as well as the $10 eagle and $20 double eagle. The cent pattern never made it into circulation, but his models for gold coins became the standard upon which all future U.S. coinage would be compared. The Saint-Gaudens gold double eagle coin especially has won universal praise for its aesthetic appeal. Hi Relief vs. Low Relief? What's the difference between the high relief Saint-Gaudens and low relief? Shown above are two Mint State Uncirculated examples of 1907 double eagles; the top image is in high relief, the bottom image in low relief. Compared next to each other, some of the differences are easy to spot, such as Liberty's left knee and foot, the roundness of her face, the fingers of her right hand, etc. The detail of the extremely high relief double eagles of which only 24 or so were coined in early 1907, is even more pronounced. Although quite beautiful, the Mint had to discontinue the high relief Saint-Gaudens Double Eagle after a short while because of their difficulty in mass production. 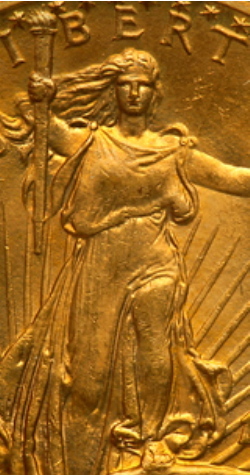 The Saint-Gaudens Double Eagle gold coin features a full length image of Miss Liberty walking forward, as if she is ready to step out of the coin. She holds aloft in her right hand a torch of enlightenment and her left hand presents an olive branch symbolic of peace. To the lower left, nearly concealed by her flowing gown, the dome of the U.S. Capitol Building is visible. The reverse is dominated by a majestic eagle in flight, bathed in sunlight. The inscriptions UNITED STATES OF AMERICA and TWENTY DOLLARS are arranged in two concentric arcs located above the eagle. The first trial samples of the Saint-Gaudens Double Eagle were struck in early 1907 and were characterized by their extremely high relief. These patterns were quite stunning in beauty and detail, but required nine hits on the coining press to achieve the desired effect. Of the two dozen or so double eagles struck during the experimentation phase, all but one of them displayed on the edge the Latin motto E PLURIBUS UNUM (translation: Out of Many, One). Every coin of this trial set carried the date in Roman numerals, MCMVII, to remind observers of the artist’s classical inspiration, and have sold at auction for as high as $3 million. The extra time required to raise an ultra high impression proved the need to rework the models to lower the relief. Before the necessary revisions were completed, Saint-Gaudens died in August 1907. The task of getting the new double eagle design into production fell wholly to his assistant, Henry Hering. On September 28, Hering personally delivered the reworked pair of double eagle models to the Mint, whereupon he encountered stiff resistance from Chief Engraver Charles Barber, who insisted the relief was still too high for practical coining. One delay led to another until on November 22, an irritated Roosevelt ordered the Mint to begin production immediately. As Barber predicted, the high relief of Hering’s reworked models proved difficult for mass production, requiring five hits apiece from the coining presses. When released a few days later, banks complained loudly that the new coins would not stack properly because of the high relief and rim problems. After making 11,250 of the high relief double eagle gold coins (an example is pictured above), Barber began using dies of lower relief and substituted the Roman date with the more familiar Arabic numerals. Some of the high relief detail was lost, but the overall beauty of the coin remained mostly intact. Before the close of 1907, nearly 362,000 of these low relief double eagles were issued. Low relief was employed from that point onward. One thing all 1907 Saint-Gaudens Double Eagles have in common is the omission of the motto IN GOD WE TRUST. Roosevelt wanted this left off because he considered it blasphemous to write the name of God on money, since it could be spent for immoral purposes. However, Congress took a dim view of the missing motto and passed legislation in 1908 mandating its restoration. 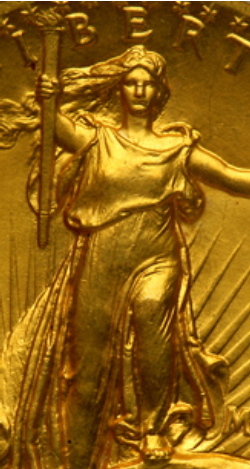 The Saint-Gaudens gold double eagle coin was issued every year from 1907 to 1916, and again from 1920 to 1933. Most of the “Saints” dated 1929 and later were held in government vaults to augment the federal gold reserve, and nearly of all these were melted following President Franklin Roosevelt’s Gold Order of 1933, a move to thwart hoarders. Under this directive, gold coinage or bullion in private hands was declared illegal, and required redemption to the government in exchange for other forms of currency. Gold coins with numismatic value were not subject to the Gold Order, however. Once the gold had been consolidated under federal control, the Treasury department set the price of gold bullion at $35.00 an ounce, up from $20.67, nearly doubling the value of the gold in its possession. The price of gold was regulated by the government until January 1, 1975, when all gold ownership restrictions and price controls were ended. The 1933 double eagle at one time held the record for the highest price ever paid for a U.S. coin when it was purchased in 2002 for $7.59 million. There were 445,500 double eagles minted in 1933, but none were ever placed into circulation and nearly every last one of them was melted down after the Gold Order was issued. Two specimens, thought at the time to be the only 1933 double eagles in existence, were transferred to the Smithsonian Institute. In 1944, the Secret Service learned a small number of the double eagles had been stolen from the Mint in 1933, thus beginning an investigation of many years. By 1952, seven of the coins had been recovered. An 8th example was found that year in the holdings of King Farouk of Egypt, deposed by a revolt of his countrymen. Arrangements were made to return the coin to the U.S., but it mysteriously disappeared before it could make the journey home. In 1996, the King Farouk specimen was seized in a law enforcement sting operation in New York City, followed by years of litigation over rightful ownership of the coin. The case was settled in 2001 when it was agreed that ownership of the 1933 double eagle would revert to the U.S. government, and the coin could then legally be sold at auction after the Treasury issued a document to officially monetize the coin. In July 2002, the coin sold for $7.59 million to an anonymous buyer. The proceeds were split between the federal government and Stephen Fenton, the man from whom the coin was seized in 1996. In August 2005, the Secret Service announced the recovery of ten additional 1933 double eagle gold coins from Joan Langbord, the daughter of Philadelphia coin dealer Israel Switt. In the 1940's, the Secret Service had connected Switt with several other confiscated 1933 double eagles. In 2011, a civil jury ruled the double eagles rightfully belonged to the U.S. government, believing the government's argument that Langbord's double eagles were illegally obtained by her father around 1933, but eluded the original Secret Service investigation. In 2012, a federal judge confirmed the jury's decision. While legal maneuvers continue, all ten of the 1933 double eagles reside at the U.S. Bullion Depository at Fort Knox, Ky. There are several key date “Saints” that are rare not so much because few were made, but due to heavy melting. The rarest of these is the 1927-D. Out of an original mintage of 180,000, only a microscopic number remain. Top grade examples can fetch as much as $2 million. Fortunately, a number of European banks had tucked away a healthy supply of double eagles, including a smattering of post-1928 double eagles and were spared a fiery fate. A good piece of advice for purchasing key date Saint-Gaudens Double Eagles is to consider only coins that have been certified by one of the four leading grading service companies: PCGS, NGC, ICG, or ANACS. Other grading services may be legitimate (then again maybe not), but for coins this rare and valuable, do what experienced collectors do and insist upon certification by the most reputable grading services. 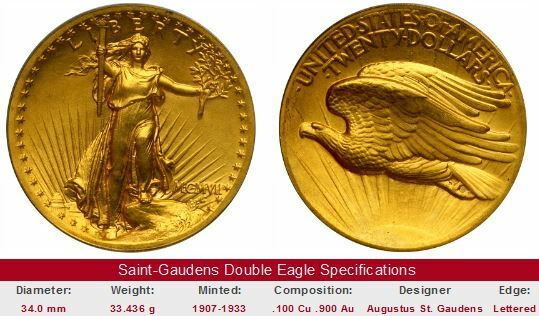 The links below initiate a search of eBay coin auctions for the indicated key date Saint-Gaudens Double Eagle. The left hand side of each "Sales Box" reports value trends over a very long period of time for the key date in XF-40 condition. The percent annual increase since 1950 is computed for comparative purposes. The "View All" link on the right side of the Sales Box is coded to isolate examples for sale on eBay of the indicated date. Most likely, you won't find any examples on the auction block, attesting to the scarcity of the key date Saint-Gaudens Double Eagles. Also, the coin pictured for sale in the right hand side, if any, is not necessarily the same condition coin as that represented in the value trend analysis on left hand side.